The club was devastated for it denied up to 3000 spectators the ideal vantage point to watch Melbourne’s games from in comfort. The City Council then added to the despair by denying the club access to its ground in Yarra Park. 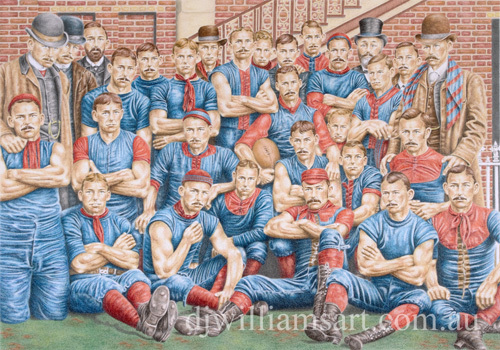 Melbourne was forced to leave the ground that had been its home for almost thirty years and find a new one for the start of the 1885 season. The MCC showed little compassion to the football club – it instead, favoured Carlton as the ground’s primary tenant. With the club engulfed by such a tainted atmosphere it was little wonder then that the team performed so poorly in the 1884 and 1885 seasons. It was a time best forgotten by the club’s long suffering supporters, but try as they did, the opening to the 1886 season would quickly remind them of their plight. Four losses from the first four outings were only bettered by a draw in round five against Essendon. A ray of light then shone down on the club with news that the MCG would again be available for home games. Supporters had longed for the moment and it clearly had a positive effect on the players. Under the capable instruction of captain, Howard Morrison, Melbourne began to perform up to the high expectations of the club’s supporters. The wins began to outnumber the losses. A set back against South Melbourne in late July proved to be the catalyst for a change in fortune and the team began a winning streak that would continue unbroken for seven weeks. Wins against Fitzroy and Essendon were followed with an impressive six goal victory over University. Melbourne’s play could not be faulted, and in the meeting with the old foe, Carlton, on the following Saturday at the MCG, Melbourne put on its best performance for the season and at the close of play had its nose in front by one goal. It was a deserving victory and both teams were highly praised for their efforts that day. It was said that the match rekindled fond memories of the clashes the two teams once regularly fought. The wins continued to mount up until two weeks prior to the season’s end the wind appeared to drop from Melbourne’s sails and it went down to both Geelong and Williamstown. Supporters of the club were nonetheless pleased by the improvement that their team had shown throughout the year. Little did they know of the dark times that lay ahead for the Melbourne club.